There is a continuous discussion is going on providing paternity leaves to the male employees in private sector companies. But till now there is no improvement on those talks. Only central government employees are entitled to avail 15 days of paternity leave during confinement of their wife. We all know how much difficult situations a woman will face during confinement but at the same time, the men will also face the same pressure psychologically. So they need some time to get out of the pressure and to spend some time with the newborn child and his wife. Here are the paternity leave rules in India that every employee has to know. In India women, employees are gettings 26 weeks of maternity leaves with the latest amendment of the maternity benefit act 1961. Only central government employees are entitled to avail 15 days of paternity leaves from the date of the delivery of the child. The male employees are allowed to utilize those 15days of paternity leave within Six months from the date of delivery of the newborn child. Male employees with less than 2 surviving children are only eligible to take 15 days of paternity leave. Male employees are eligible to get their complete salary during their 15 days of paternity leave. 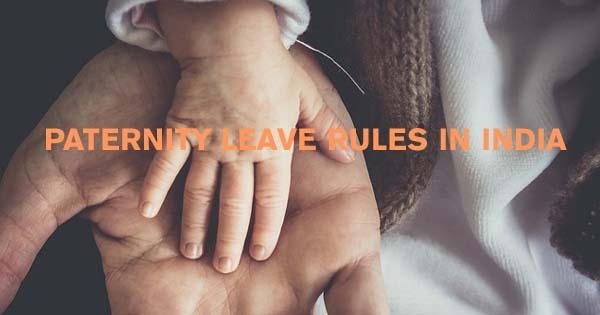 If the male employee wouldn’t able to avail those 15 days of paternity leave in stipulated 6 months time, then all those paternity leave will get lapsed. In recent days bank employees also became eligible for 15 days paternity leave under 10th wage negotiation settlement signed between Indian Banks’ Association (IBA) and the Unions/Associations of employees. Hope soon private sector employee will also become eligible for paternity leave. Paternity Benefits Bill 2017 is still pending in parliament, once this bill passes then all male employees will get 30 days of paternity leave. In January 2018 the Haryana state government has announced 15 days of paternity leave to all its state government employee, Haryana became the first state which announced paternity leaves to state government employees. How many days can a male employee get paternity leaves in India? At present only central govt employees and bank employees are eligible to get 15 days of paternity leaves for their first Two surviving children. Can I get paternity leave for the third baby? No, paternity leaves will not be allocated for the third baby. should paternity leave be prior sanctioned?